I have a sheet tracking activity scores for players across multiple accounts in a game I play. I am trying to format the scores so that the monthly cells (Columns I through T) will be red if the number for the month is less than the minimum required (column B), however, nothing I have tried seems to work from other similar questions I have looked at. 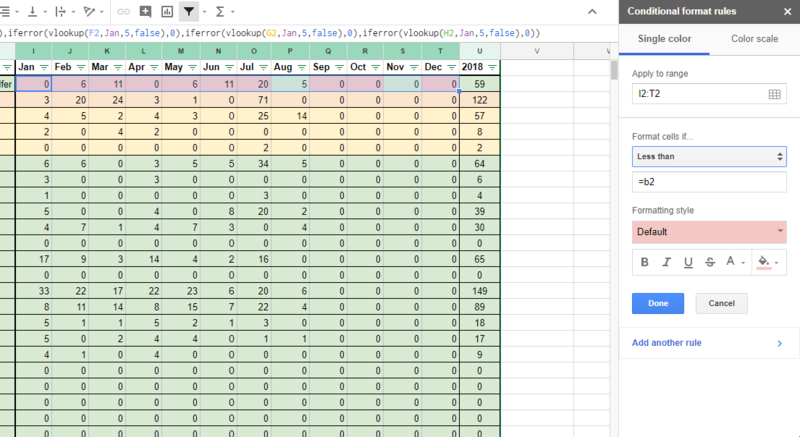 I tried a simple =I2<B2 but that ignored the 0 cells, which could be because they are results of a function which returns 0 if vlookup returns an error? I'm learning as I go so any advice would be appreciated!